A famous name in the world of boxing has just started following my progress on Twitter. You ask is it Ricky Hatton, Manny Pacquiao, Floyd Mayweather Jnr, Oscar De La Hoya? No, a much bigger man than that. Well, in body anyway. It is Audley 'A-Force' Harrison. Now I am sure it is just some Fraudley fan posing as the former Olympic champion. And don’t get me wrong, the more Twitter followers the better. But when it comes to boxers I would look up to in my hour of desperate need during triathlon training, Audley is hardly the one. Champion in Sydney in 2000, it all appeared to go to his head and in recent years it has been one failed comeback after another. The latest to Irish cab driver Martin Rogan, one to all but end his career. Despite his under achievements, I take my hat off to anybody prepared to step between the ropes and take a brutal beating. But as I look for inspiration, it is other boxers I call upon. 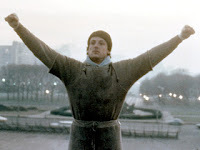 Sad, I know, but I even have the Rocky (top right) theme tune on the Ipod for when I am pounding the streets. Always a great track to get me to the end. Although I still haven’t found anything akin to those famous Philadelphia Museum of Art steps for that last darting run as the finale to a punishing workout. It comes to something when you would rather turn to a fictional slugger than Audley (below right) for your inspiration. However, watching the 24/7 shows charting the build up to the likes of Hatton/Mayweather, it is jaw-dropping to see how much effort goes into those 12-week or so training camps. Despite all the trainers, conditioning coaches and nutritionists it is still sheer blood, sweat and tears that gets them ready and in peak condition for when that first bell rings on fight night. That is how I look at it. I have longer to train but when August 2 comes I want to be in tip-top shape so there can be no excuses if I fail to complete the London Triathlon. For me, Audley always strikes me as a man who could have achieved so much more had he shown the application of the likes of Hatton or, dare I say it, the legend Rocky himself! I do not want to be in a position to under achieve. As for charting my progress, I hope I can impress the A-Force with my punishing training regime. If not, I’ll just be another Fraudley.